This report is based on the findings of a November 2015-January 2016 survey exploring the views of 93 patient groups in 2015, focusing on differing medical specialties. 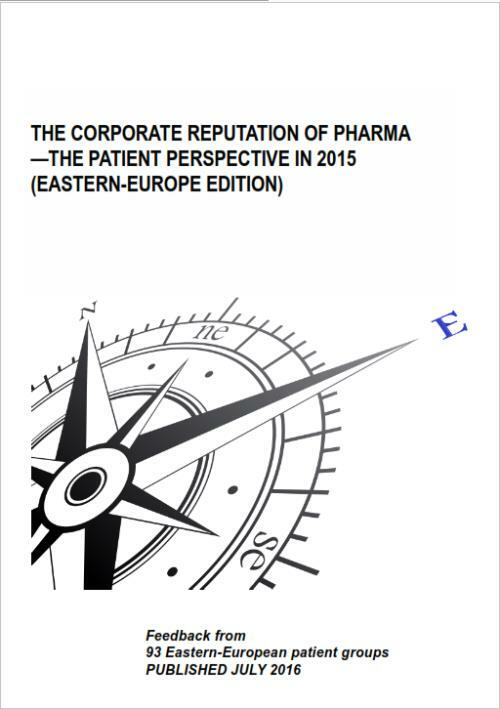 The report provides feedback on the corporate reputation of the Eastern-European pharma industry during 2015, as well as the performance of 19 pharma companies for six key indicators that influence corporate reputation. Results are compared with those of the previous year. Annual revenue (latest-available year), comprising amount in currency, as quoted by the profiled company itself. Increase in revenue over the previous year or decrease in revenue. The profiled company’s main treatment subject areas (and areas of R&D). A mission statement from the profiled company. The profiled company’s performance at the six indicators of corporate reputation in 2015, according to the patient groups in Eastern Europe familiar with the company. The profiled company’s performance at the six indicators of corporate reputation, according to the patient groups in Eastern Europe that have worked with the company. How the profiled company performed in Eastern Europe for different therapy areas, compared with the company’s averages in Eastern Europe across all therapy areas in 2015. How the profiled company performed in Eastern Europe for different countries/regions, compared with the company’s averages in Eastern Europe in 2015. Other companies that partner with a significant number of the profiled company’s partner patient groups. The therapy areas and countries of the patient groups familiar with the profiled company.